Haha if I am perfectly honest – I only did it because the flights from Colombia to Ecuador were pretty pricey (if only I had know about Viva Colombia before – though they technically they don’t fly Medellin to Quito) and I end up cheating a bit as I choose a way that would make it the shortest bus/border crossing. 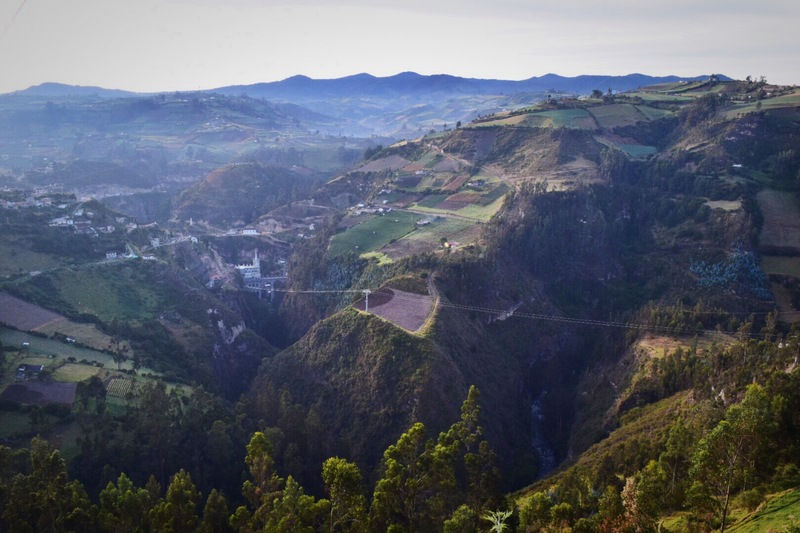 I took a super cheap flight from Medellin to Pasto which is about two and half hours from the border. As a solo traveler, you have to depend on your gut instincts often and I learned that I can tell pretty early on if someone is going to be an asset or not. I also learned that we are taught to be polite but sometimes in standing up for yourself, it’s better to be rude then have someone take advantage of you. 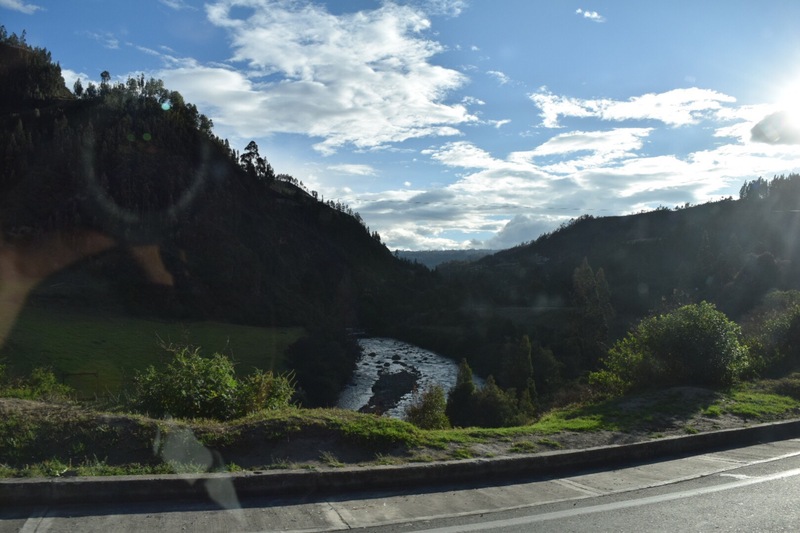 I had asked at the airport how best to get to the border and was told there was a direct bus to Ipiales and it would be faster and cheaper than going into the town of Pasto first. As I get out of the airport area, there were only taxis at first and the taxi drivers are telling me there’s no buses and that I have to take a taxi into town. They are aggressive and one grabs my bag and tries to put it in his trunk. We argue and finally they give me my bag back and I keep walking and find the buses. It was so much cheaper than a taxi and it ended up saving me about 45 minutes. 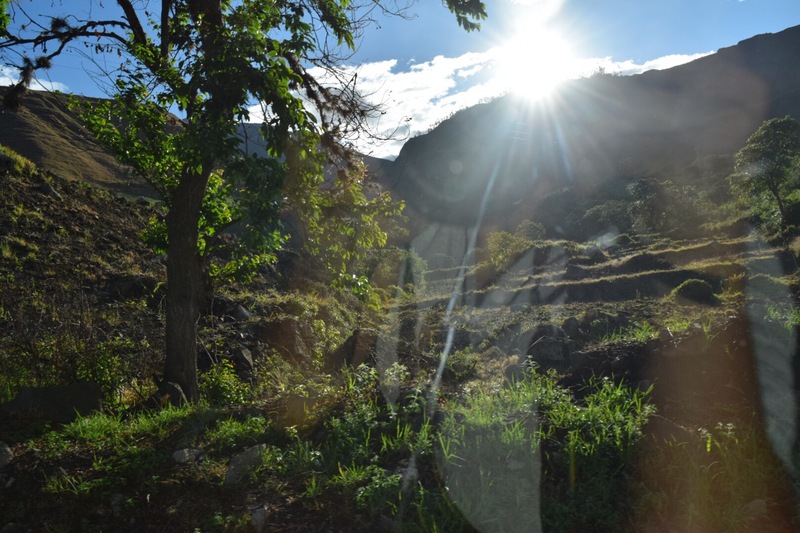 I will say that the bus ride was quite breathtaking – for two reasons. 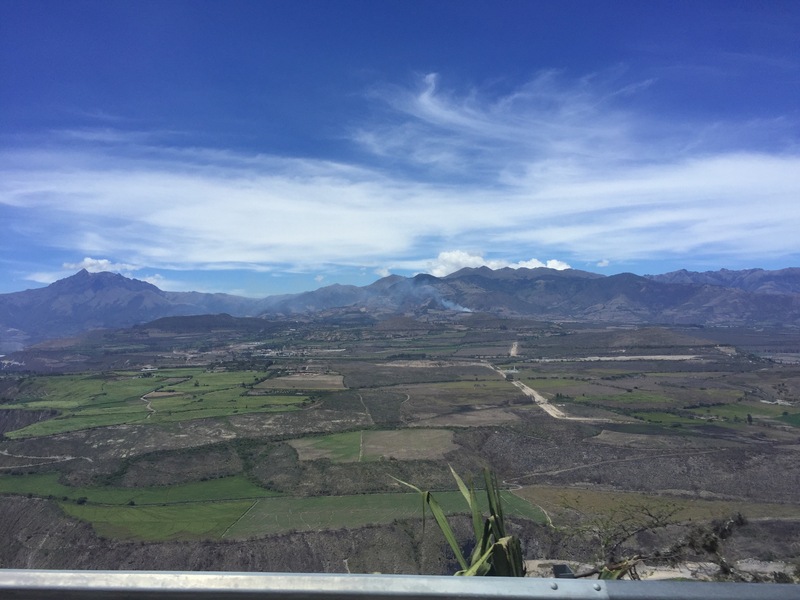 First, the drive is through the Andes and the scenery is so amazing. There is a river in the valley that you can see and the mountains are just beautiful. Second, the ride itself can be quite scary as the drivers in South America tend to drive without any regards to rules of the roads – yes nothing like seeing double yellow lines but the bus driver thinks it’s a great time to pass uphill. And turns and curves taken a rather fast speeds in a minibus made it a very interesting ride. Oh and I can never find the seat belts as apparently their use is nonexistent. I am in the back row with a mother and daughter and they notice I am taking pictures on my camera and keep telling me the view is better on the left side. I tell them it’s okay but after awhile I agree to do an awkward seat switch in a moving bus and we exchange some pleasantries. They are the first people that haven’t asked me about a boyfriend or husband when I tell them that I am traveling alone. It is still easier for me to understand than speak Spanish but I notice my improvement. I get into Ipiales at six and the mother and daughter are so sweet. They are worried about me and tell me that they’ll help me cross the border but I tell them that I will stay the night here. I had heard about this church and I really wanted to visit it since I had gone all this way. Besides it was a five hour bus ride from the border to Quito and I really didn’t want to arrive in a new city at a bus station after midnight. So we say our goodbyes and I bunker down for the night. Wake up early and head to the church and learn an important lesson in negotiations in South America. Before getting into the cab, you must make sure that the cabbie agrees to everything – fare and conditions. I had asked if it was possible to take a cab to the church and then go to the border and he said yes. I neglected to qualify with the phrase you will wait for me and you will take me to the border – correct?! Yeah bit of a shock when we get there and he gives me my bag and I try to negotiate then but I held a weak hand so I am forced to walk down then later back up the stairs to go see the church. Figured I was all the way out there and I would learn an something for next time. Mass was in session but I was able to see the church and had the best $.06 cornbread for breakfast and got in an unexpected workout so everything is good. Even had an elderly gentleman (thinking 60’s maybe even 70’s) offer to help with my bag – said it was too big for me even though he was also about my size. 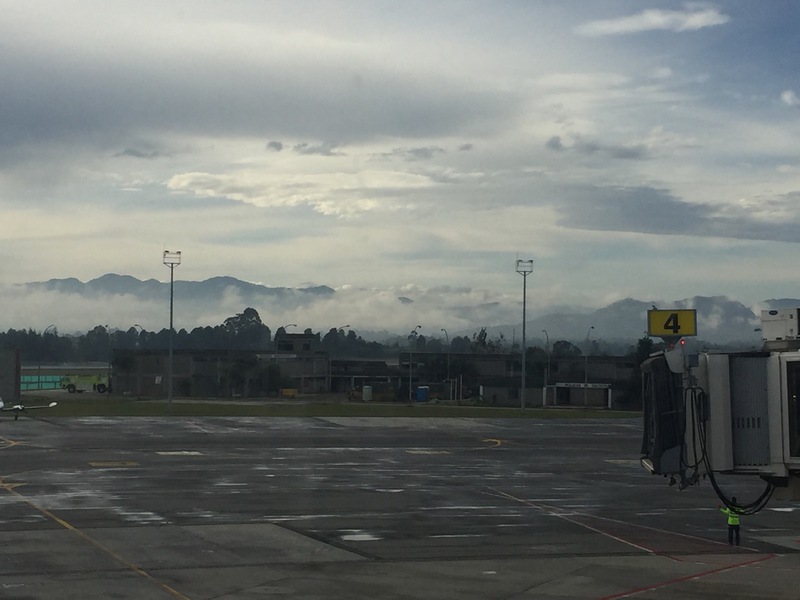 I met so many friendly and helpful Colombians – a bit sad to be leaving but time to go! is that bad my first reaction is I want to get a picture? I also learned the taxis at that site can only go to the bus terminal so I have to go back there and take another taxi to the border – what a mess!! 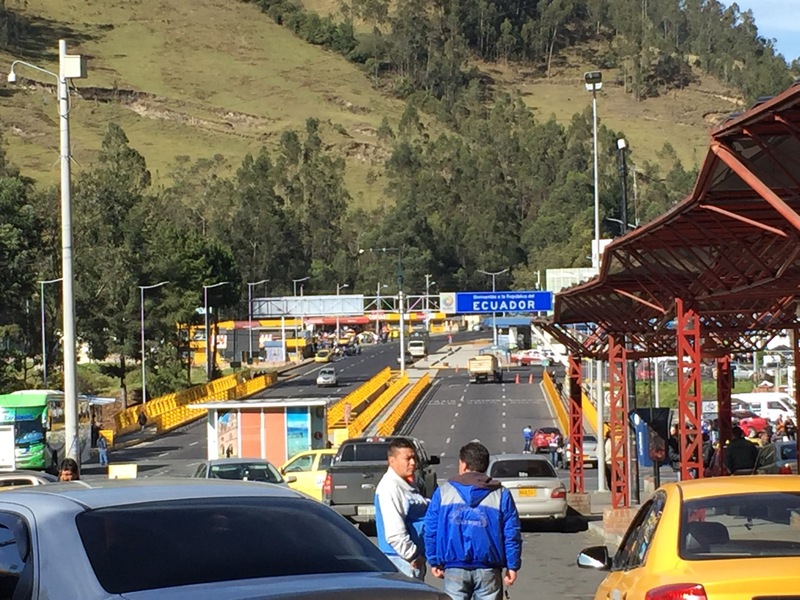 I cross the border on foot and catch a bus to Quito. It is of those large motorbuses you see often used for tourist sightseeing with reclining seats and they even played a couple of movies during the trip. There is even wifi though it only worked for the first hour. So a long bus ride down in South America is interesting as people will hop on and off to sell you food and drinks and even this kid to do a rap for cash. 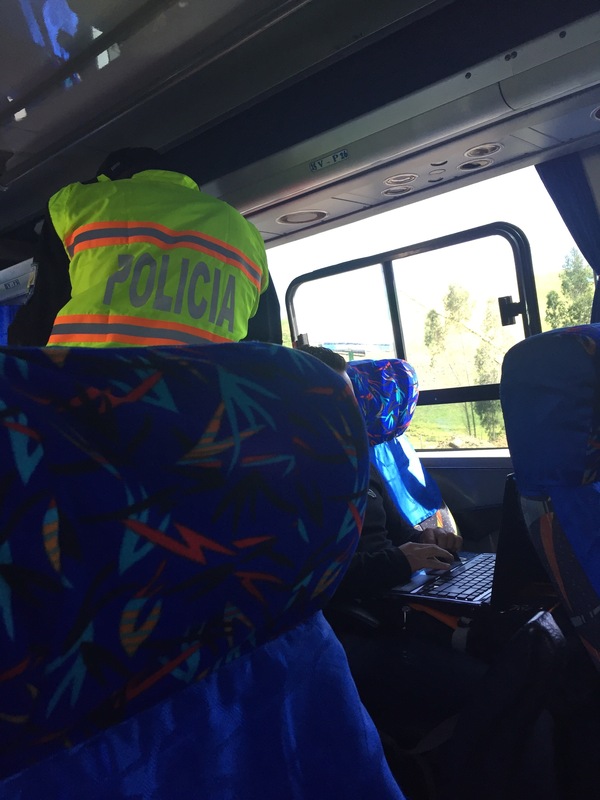 And since it was originating on the border, we have a visit from the Ecuadorian national police – K9 search of luggage compartment – everyone’s identification and bags on board are checked (well not mine – maybe American passport?!) and there is even someone pulled from the bus. But that is the most action during the bus ride and again I sit back and enjoy the beautiful scenery. 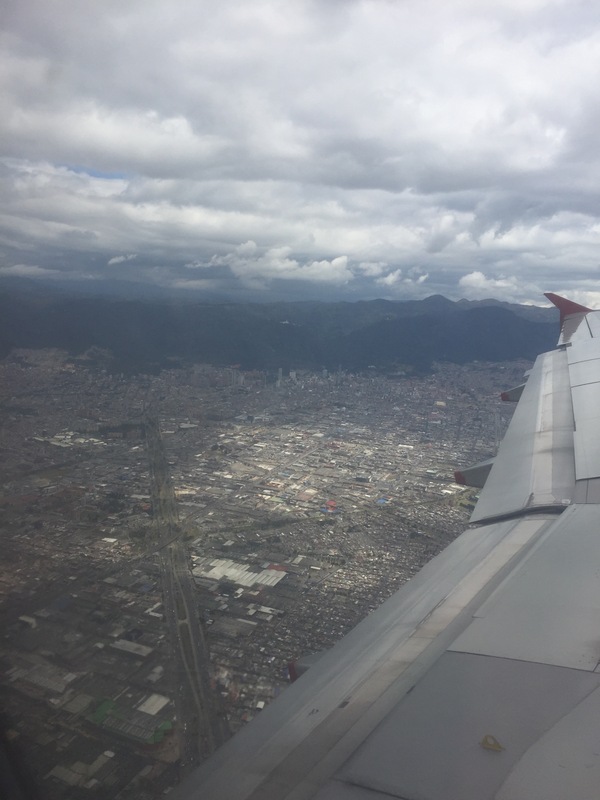 So I did it and arrive in Quito! But I wish I didn’t have to do it again but Bolivia and Chile have things I wanna see on their shared border so looking like it will be at least one more long bus ride….